Purchase steel targets and range supplies at our retail store. Once you have built your range put in the industry’s best targets. Visit our online store to shop for steel targets and range supplies. 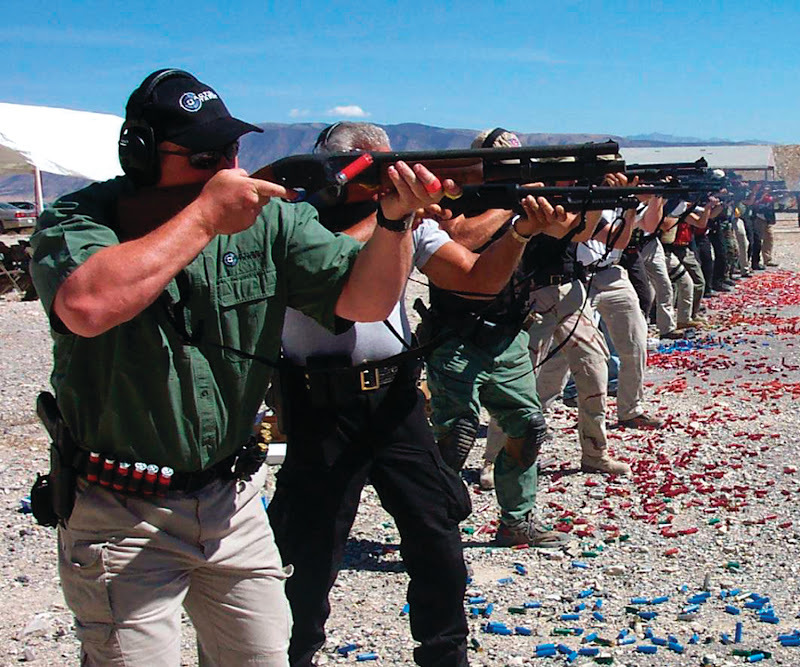 For 20 years, Action Target has hosted one of the most comprehensive training camps for law enforcement in the United States. 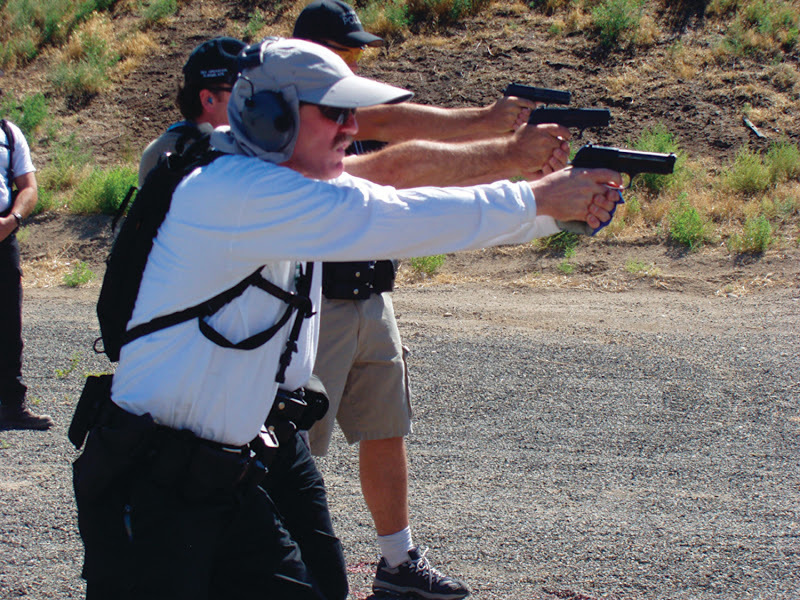 Law Enforcement Training Camp (LETC) is a week-long curriculum consisting of four eight-hour classes that are taught by world-class firearm instructors. This year’s LETC provides highly qualified instructors with backgrounds consisting of the Safariland Shooting School, Hoffner’s Training Division, Team Spartan, GLOCK Training, Bill Rogers Shooting School, and the Action Target Academy. Combining high caliber instruction with an effective and comprehensive curriculum makes LETC one of most anticipated events among law enforcement agencies from the U.S. and abroad. This event creates an opportunity for more hands on practical application of training, idea sharing, the exchange of great stories among advanced trainers and fellow law enforcement officers, and of course, the most trigger time. Each year, those participating in LETC take what they learned and incorporate that knowledge into their existing firearms training programs to help their academy and in-service personnel become more effective. LETC will be held September 12-16, 2011 in Provo, UT. Don’t waste any time! 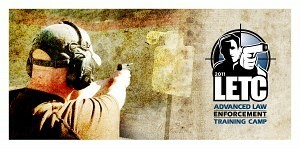 Register by July 31, 2011 and only pay $450 to enjoy a week of shooting and learning from the best law enforcement firearms instructors in the US. Regular admission pricing for LETC begins August 1. Hosting sponsors provide for some scholarships, so please contact your territory managers to see if you qualify. For more information on LETC, or to take advantage of early registration savings, visit the Training Calendar on our website, or download our information packet and registration form (PDF). 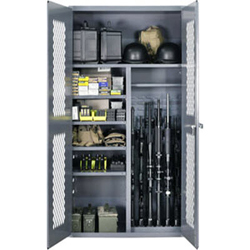 As a leader of innovative solutions for firearms training, we recently announced the addition of two new items to our product line, the Pelvic Torso and Sport Rack, at the 2011 Shot Show in Las Vegas, NV. In this week’s newsletter, we will highlight the Pelvic Torso and how to utilize it to enhance your training. 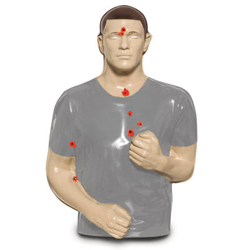 Until recently, there were only paper targets replicating the pelvic area of the body, but with the Pelvic Torso, you now have the first and only steel target option in the world that simulates this area. The steel provides instant feedback to multiple senses as you hear the bullet strike and see the steal plate swing upon impact. The idea to design the Pelvic Torso came from inquiries from law enforcement and the military for a training element that gave them a tactical solution when engaging with a specific type of threat. As they engaged with threats wearing body armor and no clear head shot, the pelvic girdle became the optimal target area. When an individual is struck in the pelvic girdle, the bullet strikes the ball-and-socket area, which not only causes immense pain but immobilizes the threat completely. If you are participating in disabling drills, the Pelvic Torso is the best training option in the market. 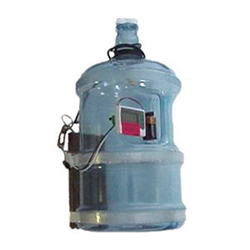 The Pelvic Torso is designed to have two 4” round reactive and auto-resetting head plates added to a non-reduced torso-type head plate. These “bolt-on” options are able to attach to your existing Static Target Stand or PT Practice Stand . We recommend using the torso head plates to protect the reactive components and keep all bolts/brackets out of the shooting zone, although it can be used with the Hostage and Full Size IPSC Torso Head Plates . 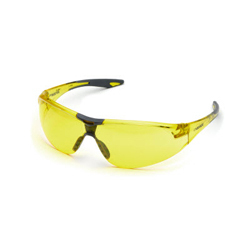 This allows the splatter to continue to be directed down from the head plate and will not be redirected toward the shooter. Yes, I am interested in the Pelvic Torso and would like to be added to the list so I will be sent more information about the final products price and release date when it becomes available. Yes, this looks like a product that I would buy when it is released, but I do not want to be sent more information about it. No, I don’t imagine ever purchasing this product and would prefer not to receive any more information about it. For more information, download the Pelvic Torso Cut Sheet here (PDF). 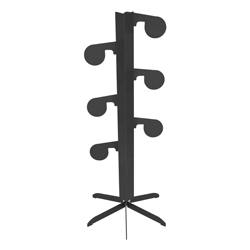 Stay tuned to for next week’s newsletter focusing on our new Sport Rack. Disclaimer 1: I do not consider myself to be an expert on any of the above topics. I am, however, really good at asking questions. I am a serious student of human behavior under stress. Disclaimer 2: In no way what I write should be misinterpreted as passing judgment on the Officer(s) involved. In the past, I have been judged by people who were not beside me when bad things happened. I refuse to be a “Monday morning quarterback” to situations I was not involved in. Disclaimer 3: The above title gives the reader an insight into how my mind works. I struggle on a good day to have an independent thought. I have had the privilege, however, to have trained with some absolutely brilliant thinkers / operators / teachers. I will attempt to give them the credit they deserve. Recently, a transit Officer was convicted of homicide after he shot an individual to death while attempting to control the subject’s behavior. According to the Officer’s testimony, he thought he was reaching for his Taser but discharged his duty firearm instead, killing the subject. Now, I am not here to pass judgment on the Officer’s actions, as I was not there. But for some time, I have recommended that Tasers be mounted on the duty belt on the non-dominant side, with the grip pointed backward, NOT in a cross-draw position. Why? Well, over the course of his / her career, a LEO may pull their handgun from its holster hundreds, maybe thousands of times during in-service training and qualification. A LE Trainer may pull a handgun from its holster tens of thousands of times. How many times does an average LEO pull a Taser from its holster and discharge it? In most departments that I have trained with, after initial training (with its “special” videotaped moments), the only time a Taser gets pulled from its holster is when it is used on a subject. I know of no in-service or qualification live fire course of fire for the Taser. I only wish I could remember who told me that so I could give them credit. The point is, the dominant hand has been conditioned by hundreds (if not thousands) of repetitions to access and fire the handgun, not the Taser. Similarly, I wish I could have a dollar for every time I saw on the range a cell phone or pager get pulled from the belt and forcibly stuffed into the magazine well of a weapon. Why? Because the operator was reverting back to the location and object on his / her duty belt that (s)he accesses most often in the course of a day – dozens of times. (1) H = log2(n + 1). (2) H = Σ pi log2(1/pi + 1). H = the information-theoretic entropy of a decision. n = the number of equally probable alternatives. pi = the probability of alternative i for n alternatives of unequal probability. Now, I have no idea what that means, but it may be useful in calculating the probability of getting a raise or the budget you submitted. “Entropy of the decision” is the scientific way of saying “brain cramp”! What is important to note is that formula was established by test subjects that were not being presented with life-threatening stimuli, and under ideal conditions, reaction time is a logarithmic, (12, 22, 32, etc.) not an arithmetic (1 + 1, 2 + 1, etc.) variable. Now, how many use of force options does the average Officer have? And, let us not forget that word that has been pounded into every Officer’s head (and we have to share the responsibility for this one): Liability. Now, let’s add the one factor that throws almost all probability theory out the window: Life – threatening stimuli. A concept which may be more useful in understanding actual reaction time under life – threatening circumstances may be USAF Lt. Col. (Ret.) John Boyd’s OODA loop. It is not my intention here to recap my understanding of the OODA loop. (For an excellent summary, please locate and read Ken Good’s article, “Got a Second? Boyd’s OODA Cycle in the Close Quarter Battle Environment”.) Suffice it to say that after being in and running a few force-on-force simulations, most people (including myself) make mistakes in the initial Observation phase and then get caught in what Ken Murray describes as a “goofy loop” 2 – unable to make an appropriate decision as to what to do next. Or, caught on the reaction (wrong) side of the action / reaction curve. All less lethal tools (including radio, pager, and cell phone) on the non – dominant side of the duty belt / LBE, etc., accessed and practiced with the non-dominant hand. All lethal force tools on the dominant side of the duty belt, accessed and practiced with the dominant hand. 2. Kenneth R. Murray, “Training at the Speed of Life, Volume 1”, copyright Armiger Publications, 2004.